This year marks the 15th anniversary of the founding of the Shanghai Cooperation Organization (SCO). From Sino-Soviet border talks, Shanghai Five, establishment to expansion, the organization has seen tremendous achievements over the years amid drastic international and regional changes. With the SCO's establishment, Eurasia's geopolitics is witnessing gradual reintegration from post-Soviet fragmentation. The power pattern has been increasingly balanced in the region, which dispels the possibility of regional unrest and benefits regional peace, stability and development. The SCO members have highly consistent interests in security, and jointly cooperate to crack down upon "three forces," drug trafficking and illegal weapon sales. Tashkent's anti-terrorism organizations have carried out effective operations in coordinating member countries' actions. An anti-terrorism intelligence exchange mechanism has been established as well. With the SCO anti-terror drills being held for years, cooperative mechanisms are playing an increasingly active role in the region. The SCO is making unremitting efforts to promote trade convenience and transportation integration, and has signed a large number of documents to further this end. Member states are witnessing active trade activities and deepening cooperation in energy, transportation, telecommunications, finance, technology, agriculture and tourism. Joint cooperation provides the region with impetus to develop its economy, upgrade industries and perfect economic structures. Cooperation in education, technology, sanitation and tourism is growing as well. Friendly exchanges between member states have consolidated the people-to-people foundations for political mutual trust. 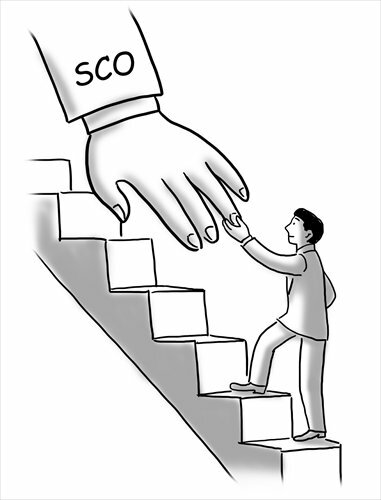 Despite the above, the SCO, like other young international blocs, faces a number of tough difficulties as well. To begin with, Eurasia is undergoing fundamental changes, posing realistic challenges to the SCO's further development. The global financial crisis, the sluggish prices of staple commodities and Russia's sanctions-triggered economic deterioration have exerted negative effects on SCO members' economy and stability. Major powers have deeply intervened in regional affairs, upsetting SCO members' joint interests. All these factors have made all-round cooperation more difficult within the SCO. In addition, SCO members have for long been perplexed by a number of disputes over territory, water resources and ethnicity. Diverse interest demands have restrained deepened cooperation among SCO members. Furthermore, different diplomatic strategies and interests have impeded the SCO's efficiency in economic cooperation. For instance, while Russia proposes building the SCO development bank on the basis of Eurasian Development Bank (EDB) or by expanding the functions of the SCO Interbank Consortium, Uzbekistan, which is not an EDB member, opposes Russia's proposals. Appeals for the SCO free trade zone, which is supported by Kazakhstan, Kyrgyzstan and Tajikistan, are opposed by Russia and Uzbekistan. These divergences are caused by SCO members' diversifying diplomatic strategies and interests. Some members are suspicious of the regional integration process. The SCO follows the consensus rule; in other words, official decisions have to be approved by all member states after equal consultations. This is in accordance with the "Shanghai Spirit," but makes substantial progress on major issues where members hold divergences hard to achieve. The SCO has legally approved granting India and Pakistan membership status. The organization will face a series of new challenges in the future, for instance, how to define the SCO's functionality and how to carry out more effective cooperation after the expansion. Nonetheless, the SCO, with "Shanghai Spirit" as its soul, conforms to the interests of all of its members, observers and dialogue partners. The difficulties will be gradually settled, and the SCO will bring into full play its vitality and potentiality to contribute to regional peace, stability and prosperity.